So, since the Hiroshima trip, things have been fairly quiet for me! Partly due to the fact that my knee is still healing and so I don’t want to injure myself any further. I need to help myself, not the opposite! So this week Monday, Tuesday and Wednesday has been my school’s 中間試験 (Mid-year exams) so I’ve been quite free, except for monday morning from approx. 9am – 10am in which I had to rush around to 6 different classes and verbally do the listening section in front of the students. I have been marking some of the exams and I’m glad that most students got all my section right, but the teachers sometimes have trouble with my accent, even though it’s not terribly a strong Australian accent.. But anyway, things are ok because I’ve managed to get half days these last few days.. but back to the crunch of things tomorrow!! Everyone was taking pictures with him! I thought it was quite brave on his part, wearing that out in public.. But I guess Halloween is just around the corner! Also whilst walking around with my head phones in my ears.. I don’t know how, but this guy did the “pull out your head phones” sign to me, so I did, and then he started talking away in Japanese.. I didn’t want to listen, so I put them back in and then started to walk, but then he started to follow me and did the “please” sign (two hands put together), so I took them out and he’s like, please come to me store and just have a look. I love being tall and skinny.. but in Japan, I wish I was a bit smaller and a bit skinnier.. and I’m also not sure when people look at me what they are thinking.. good things? bad things? Does it really matter? Kinda.. 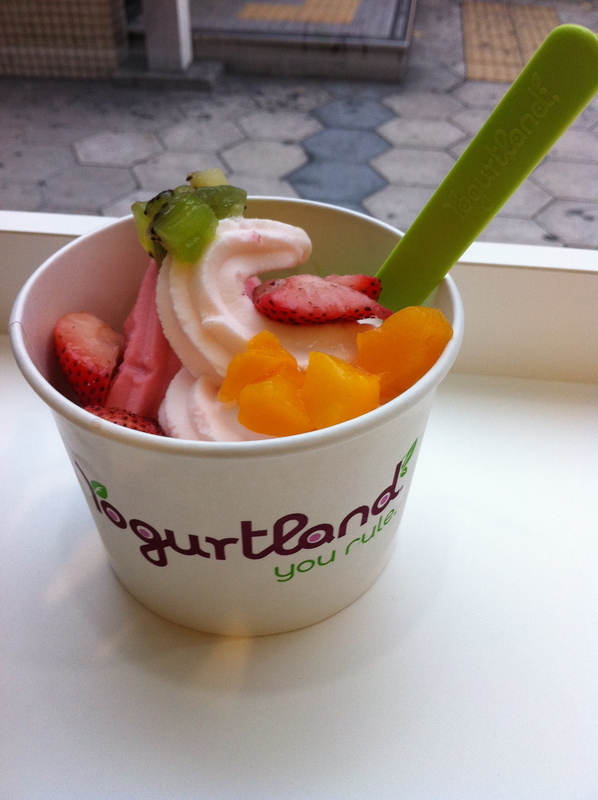 But going to Yoghurtland in Namba makes everything better! I went here for the first time.. I’ve wanted to go here ever since I saw it open, and David, another JET loves this place.. so I finally decided to stop and give it a whirl.. and yes.. it’s damn good! I’m so coming back here again! I’ve had similar things to this, but yoghurtland is so cheap for the amount that you get.. I feel like i’m ripping them off.. a similar feeling I get when I go to 飲み放題 (drink-buffet).. but I think it’s just part of the package that comes with living in Japan (from a foreigners eyes). So I can’t really say much at the moment, but I’m not going to the Osaka Halloween party anymore… I’m going to go to Nagoya instead. I’ve yet to experience a real Halloween party, and I guess that’s going to be delayed 1 more year. 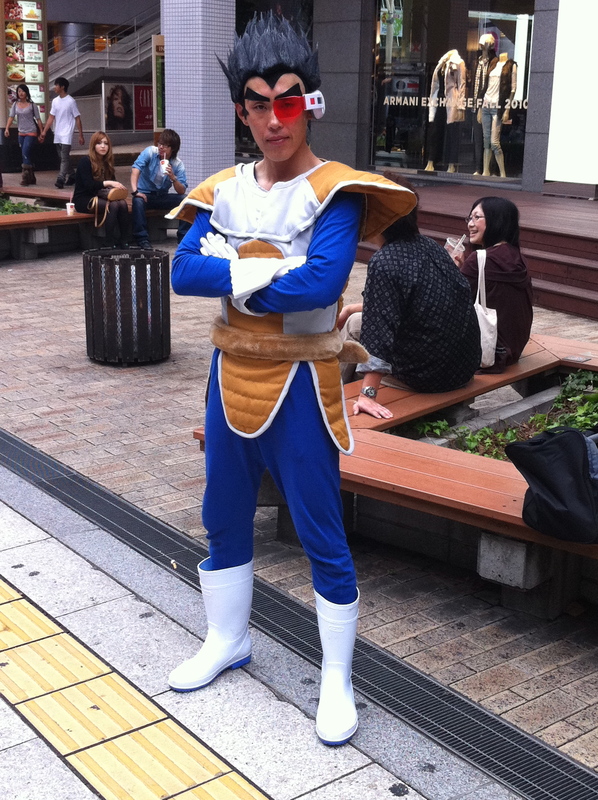 But on the up side, I will get to visit my friends in Nagoya that I haven’t seen for like 2 or 3 years! Gosh.. I can’t believe it’s been that long already!! I still have to buy my shinkansen ticket, and I’m still not sure if I’m going to stay at my friend’s place.. or if I should just go ahead and book my own accommodation… hmmm.. Anyway, definitely looking forward to this Friday night, when some of the other JETs will come over to my place and have a movie night.. Raz is going to bring her HD full of movies, Ali is going to bring her computer speakers just incase there’s no sound cable and we have to play the sound from my computer and Jon is going to bring the necessary cables to connect the TV and Macbook Pro together~ We’re going to go to あけぼの (Akebono) for dinner.. just because I love that place, and I think the food is pretty good and I want others to experience it! and then movie time!! Which reminds me, I have to tidy up my place.. probably tonight, because tomorrow I want to go to Basketball club and Volleyball club and then go to the gym after that..
Oh.. and 1 last thing before I sign off.. my learn Japanese books came today (The ones we get from CLAIR).. I’m so happy that I can now really try and get stuck into studying! I think my Korean is going to get progressively worse, even though I can still help Ali with the basics.. but time to レベル アップ (level up) my Japanese I think!